Well, I can't believe this happened. But the winner of the giveaway two weeks back never claimed the prize. 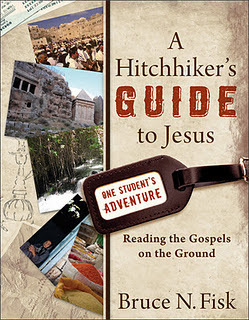 Consequently, I have enforced the five day rule and once again will attempt to giveaway Bruce Fisk's A Hitchhiker's Guide to Jesus: Reading the Gospels on the Ground (Baker, 2011). I posted a review of the book as part of the Baker Books Blog Tour. This imaginative approach to Jesus studies chronicles the journey of Norm, a fictional college graduate who travels to the Middle East to see if he can study Jesus and follow him at the same time, and if curiosity will make him a better disciple or no disciple at all. Norm sets out on an adventure to investigate the New Testament and the life of Jesus for himself, hitchhiking simultaneously across the Gospels and the land. His travels offer students and lay readers a creative and engaging way to explore many of the major questions in Jesus studies today. Will Norm be able to reconcile his Christian faith with critical scholarship? As readers follow his faith journey, they learn the importance of asking probing questions. The book's lavish, journal-style interior design--featuring maps, photos, doodles, sketches, and email exchanges between Norm and his professor--makes it fun to read. So enter your name below for a chance to win here. I will choose a winner on Sunday. And please remember to check back to see if you won. After five days the book goes back on the shelf, as happened here. Rob Henderson loves your column even if he doesn't win your free book. Craig W. Beard. If I win, I WILL claim the prize!! Annie Foerster ... would love to have this book!